If you’re looking for a gift for children that will provide them with countless hours of exhilaration then an electric Go-Kart would be a perfect choice. Electric Go-Karts offer a very safe and comfortable ride for young ages to enjoy cruising around their neighborhood. They’re not too slow to be fun and they’re not too fast to be unsafe. Kids can enjoy the feeling of driving a car but with the simplicity you might find when riding other vehicles like bikes or scooters. If you’re not sure what model to get, then have no worries. Below I’ll be discussing four of the best electric Go-Karts for kids that will be a guaranteed hit. 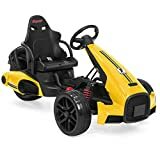 If you’ve never purchased an electric Go-Kart for kids before and want to know how to decide what is worth buying, then this section will be helpful. It isn’t the same as deciding on what car to get but some of the principles are the same. It isn’t a complex process so have no worries there. Since we’re dealing with children, safety is probably going to be our number one priority. When I look at Go-Karts for kids I always have to see how sturdy the build quality is. Even if they look comfortable and fun, my assessment of them drops significantly if they aren’t safe enough. Wheels have to be able to turn accurately, the seat has to keep the driver secure, and preferably, there is a responsive braking system. Speed is what I normally look at next. Different Go-Karts have different top speeds which will be better suited to a child depending on his or her age and size. For your convenience, I’ve arranged the four karts below in order from slowest to fastest. This will allow you to make an easier decision if speed is your number one priority. But don’t write off any of the somewhat slower models without reading about them first. Although they may be a bit slower than the fastest model, they might offer other benefits that you hadn’t initially realized were so important. Comfort is usually last on the list. This applies to how it feels sitting in the Go-Kart and actually driving it as well. 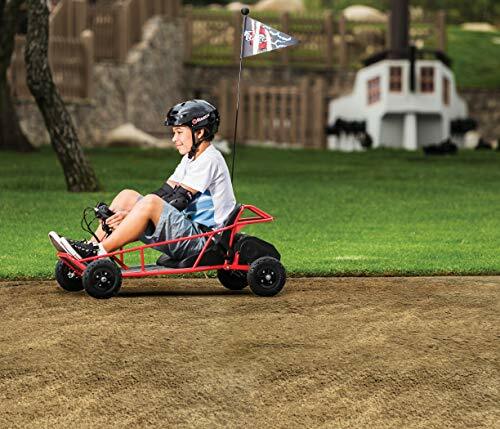 Electric Go-Karts for kids are usually designed for sidewalks and grass only, but they still ought to be able to provide a riding experience that is as smooth and stable as possible. Basic specifications like load capacity and battery life are no-brainers but I don’t weight these quite as much as the previous aspects. That’s pretty much all there is to it. Now that we’re all set with the legwork let’s dive into the four best electric Go-Karts for kids. The Best Choice Kart is best suited for young children from the age of 3 due to the very limited top speed. 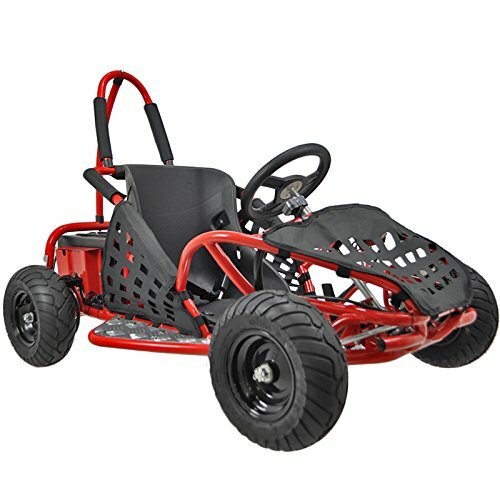 The Best Choice Products Go-Kart is the top option you can get for children of younger ages. It is a stylish machine that is fitted with basic essentials to make your five or six-year-old feel like they are in their very first car. Let’s begin with the basic specs. The Best Choice Go-Kart has a weight capacity of about 77 pounds. You could go a little over if necessary but not by much. This is a fairly lightweight electric Go-Kart for kids. Kids around age 10 would probably be too heavy for it. This electric Go-Kart has a top speed of 2.8 miles per hour, making it by far the slowest Go-Kart on my list. This makes it a great choice for parents who don’t want to give their little ones something with too much power. This kart is surprisingly the one that looks the most like an actual Go-Kart on this list. The design of the frame looks just like real Go-Karts at a dedicated course. The machine is triggered by a foot pedal which adds to the immersion and entertainment of the little ones. It comes available in two colors, red and yellow. Both fit the shape of this electric Go-Kart very well. I would be surprised if any young boy or girl would be disappointed with the look of either of these choices. The paint job is a simple but solid finish and will not age too quickly. The only thing about it that does look different is the fact that it only has three wheels. A large rear tire sits behind and beneath the driver’s seat. This is no problem considering that 3mph isn’t fast enough to warrant a fourth wheel. It still steers fine and is well balanced. 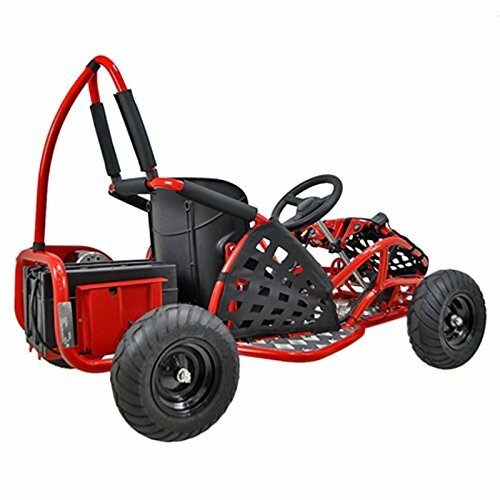 Keep in mind that the Best Products 12V Go-Kart is smaller than it looks. Best Products recommends this for ages 3+ but what they should have mentioned is that it may also be too small for ages 8+. The Best Products electric Go-Kart for kids weighs around 40 pounds, making it by far the lightest electric Go-Kart on this list. As far as comfort is concerned, the driver’s seat is well crafted. It keeps the back well postured and it even comes with small armrests on both sides. The foot pedal is located on the right-hand side right next to the wheel. Children riding this electric Go-Kart will have to have their knees elevated but it doesn’t seem to cause any discomfort. All three tires are thick and well-leveled. The machine seems to move quite nicely on pavement and roads. 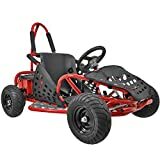 I did notice that steering on grass provided a slower turn but odds are most kids who own this electric Go-Kart will want to stick to hard surfaces. The Best Products 12V doesn’t have any brakes but don’t let that alarm you. Since the top speed doesn’t even reach 3mph, the lack of brakes makes sense. The Go-Kart decelerates at a reasonable pace once the pedal is no longer pressed. Best Products also included a seat belt that wraps around just below the waistline. It’s easy to secure and easy to remove. Additionally, this electric Go-Kart for kids comes with a wheel horn. It’s not too loud but has just enough volume to allow your kids to not only alert pedestrians around but to also have extra fun experiencing what it’s like to drive. Arguably the Best Products’ best feature is the dual speed switch. Depending on how young your little riders are, you can set the max speed to be 1.5mph instead of the maximum 2.8mph. This is a great feature for three and four-year-olds especially. The worst thing about the Best Products electric go-kart for kids is the battery. A single charge will last you just under an hour of use, and the charge time is extremely long. Charging from zero to full power will take you around 12 hours each time. You will have to prepare yourself to plug it in every day overnight if you expect your kids to be using the vehicle on a daily basis. The Best Products 12V electric Go-Kart is an excellent choice for families that have children of very young ages. The slow speeds and seat belt will give mom and dad peace of mind while the kids still have tons of fun honking and steering their way through parks or the neighborhood. You may need to allocate their time riding it due to the long charge time but it will definitely be one of their favorite reasons to go out and get some fresh air. The Power Wheels Dune Racer is the ideal electric Go-Kart for siblings thanks to the two seats and impressive maximum weight allowance. This is a very different kind of electric Go-Kart for kids than the one I previously discussed. It’s faster and bigger. Everything about it from the wheels to the colors looks different. If you have two kids that like to share or a slightly older one who wants a little more speed and variety then allow me to introduce the Power Wheels Dune Racer. 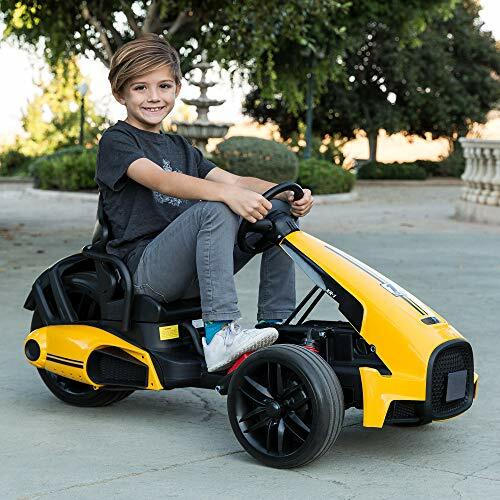 When I first saw this electric Go-Kart for kids I was instantly impressed. I noticed right off the bat how clever the unique design of the passenger seat was. Both seats can be used as a driver’s seat because the steering wheel was placed in the center. This is a spectacular move on Power Wheel’s part. Kids can either drive together or they can easily take turns without having to switch seats. It’s perfectly convenient for sharing together. Let’s talk specs. 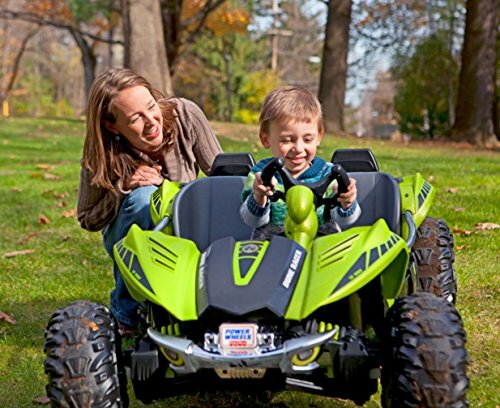 The Power Wheels Dune Racer has a max forward speed of 5 miles per hour. It also has the ability to go in reverse, which has a max speed of 2.5mph. Even at max load capacity, it can still reach its top speed. 5mph is a great speed that matches a regular walking speed. The total weight is around 70 pounds but has an impressive load capacity of double that. Even some adults can test drive this electric Go-Kart without issue. The amount of weight the Dune Racer can handle is honestly quite surprising. Thin adults can and have ridden in the Dune Racer with no issue, so two children occupying it is doable without a doubt. The Dune Racer comes in three distinct looking colors: purple, lime green, and red. The wheels are thick and reinforced with large tire grips. My first thoughts were that this electric Go-Kart for kids must be capable of riding on terrain other than sidewalks. As a matter of fact, the Dune Racer actually looks more like an ATV/Go-Kart hybrid. My theory was correct. Indeed the Dune Racer works well not just on sidewalks or driveways but rougher surfaces like gravel roads. 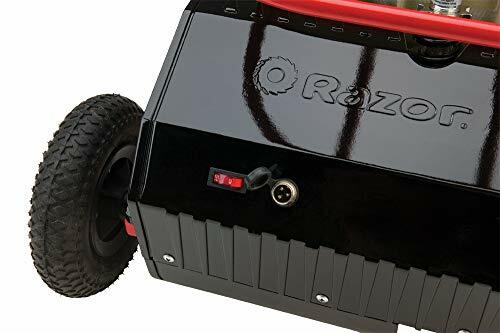 If you live in a neighborhood with rougher terrain that your children like to frequent then this electric Go-Kart will suit you and your kids just fine. The wheels provide solid traction and comfort on rough spots, keeping this vehicle more secure and stabilized than other Go-Karts. It even steers decently in both dry and wet grass. If you’ve just watered the lawn and the kids want to go for a spin, you’ll have no issues. Battery life is about one hour at max speed which is acceptable. Power Wheels also allows you to purchase an extra battery so that you can swap them out when you need to charge one and use the other. Charge time is about 12 hours so you will have to be diligent with plugging it in every night so the kids will be able to use it the next day. Power Wheels also included two seat belts and a standard braking system. Combined with the reverse function, the Dune Racer becomes a versatile electric Go-Kart for kids, allowing them to get out of awkward situations pretty easily. 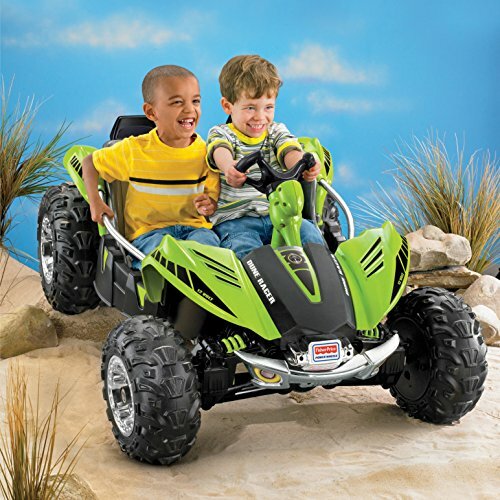 If there’s anything bad to say about the Power Wheels Dune Racer it would be that it’s a little too loud. The machine makes a rather loud humming noise, especially when moving across wet grass. 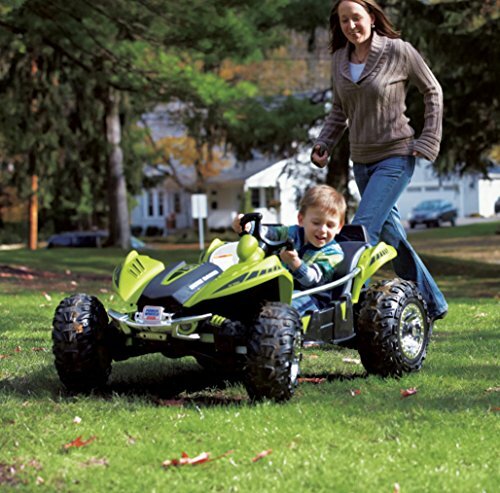 The Razor Dune Buggy provides a lot of bang for the buck with a top speed of 10 mph that will satisfy most kids. As promised from before, we’re starting to enter the territory of faster electric Go-Karts. 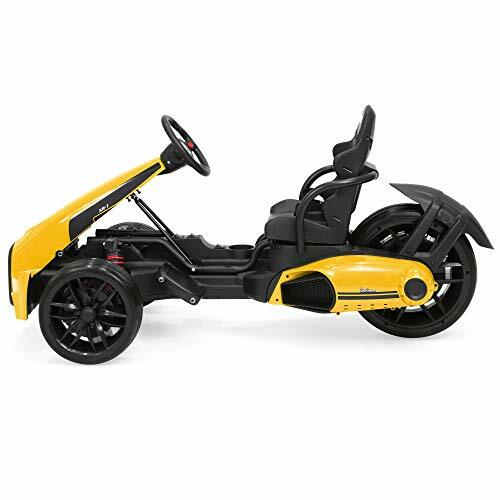 If 3 or 5 miles per hour isn’t enough to satisfy your kids’ need for speed then hopefully the thin and sleek Razor Dune Buggy will get the job done. This may look like a minimalist design but don’t let that fool you, this kart is heavier than it looks. 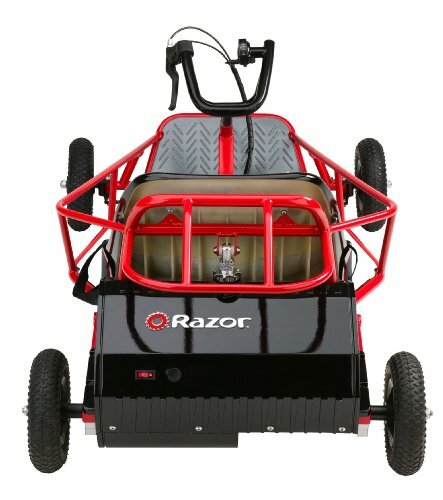 Weighing in at a total of approximately 80 pounds, the Razor Dune Buggy is tougher than it looks. The recommended age for use is 8-10 years old but as long as your child weighs under 130 pounds then they’ll still be compatible with it. As for speed, the Razor Dune Buggy has an impressive max speed of 10 miles per hour. This makes it twice as fast as the Dune Racer despite being a little heavier. 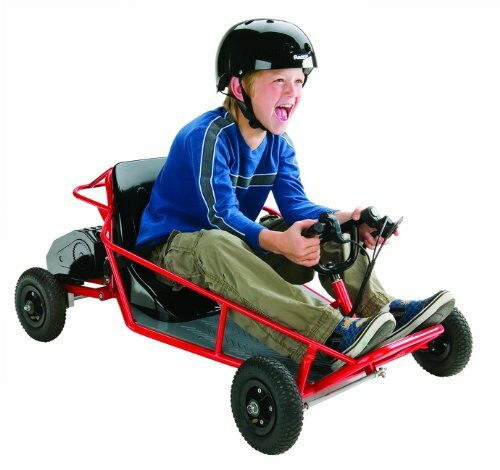 That means that any youngster that is looking for more of a thrill will surely be satisfied with this electric Go-Kart. Parents will be happy to know that the Dune Buggy comes not only with a seat belt and brakes but a throttle system. The throttle allows kids to easily control the speed they want. It’s very responsive and easy to use. Kids have manipulated the controls without any issue and have never voiced any concern with being unable to get the speed that they wanted. The braking system has been tested and works very well at any speed, even the max 10mph. 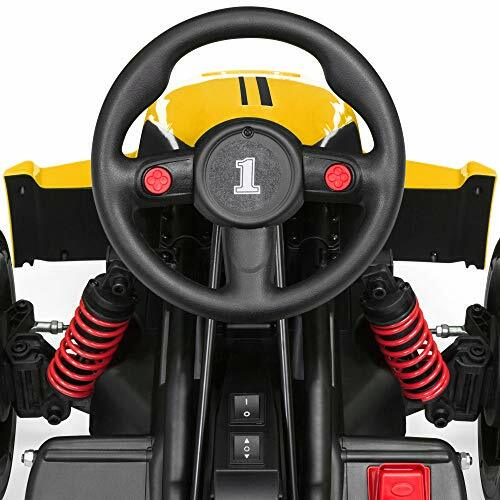 The brake lever on the right-hand side of the steering wheel activates a disc on the rear tires that stops the electric Go-Kart. It works just like any reliable braking system on a bicycle. It’s easy to use and can be depended on. The Razor Dune Buggy works great on smooth surfaces. This includes dirt roads with little bumps as well as asphalt roads and sidewalks. It doesn’t work too well on grass or wet surfaces but chances are your kids will want spaces that are wider than a front lawn for speeds higher than 5mph. The wheels are relatively thin which allows for sharper turns at faster speeds. Because the overall weight is 80 pounds, it makes it easy for the Dune Buggy to stay stable when turning. Despite its looks, it is much harder to topple over than one might expect. When it comes to battery life, the Dune Buggy doesn’t last too long. 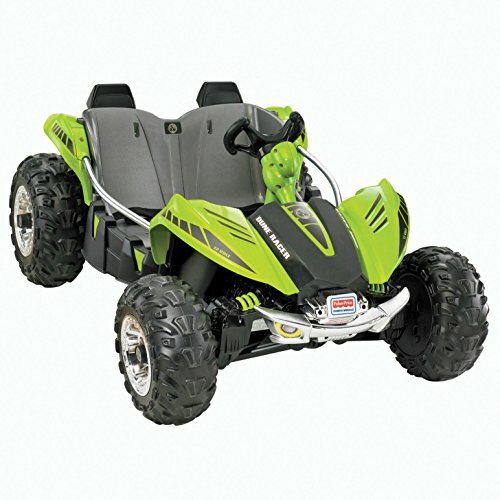 It is equipped with the same kind of battery seen in many other electric Go-Karts for kids. That means you can probably only get a little over half an hour when going at max speed. The Dune Buggy is also a little small despite being aimed for older kids. Depending on the size of the rider, they may feel a little cramped. I would still wholeheartedly recommend this electric Go-Kart for kids who are looking for a stable and smooth riding experience that has good brakes, throttle control and speeds that will turn their neighborhood into their very own race track. 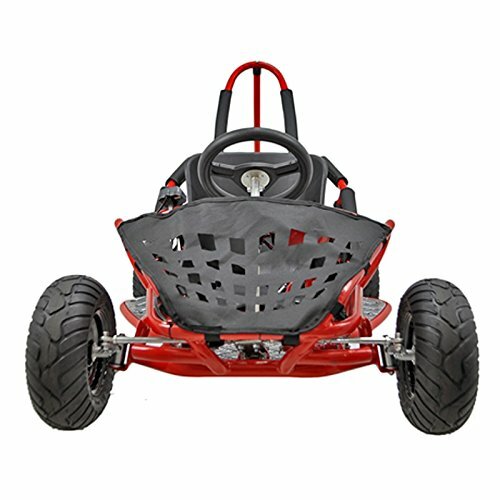 The Go-Bowen Baja is by far the fastest electric Go-Kart on this list and one that will surely excite any older child. 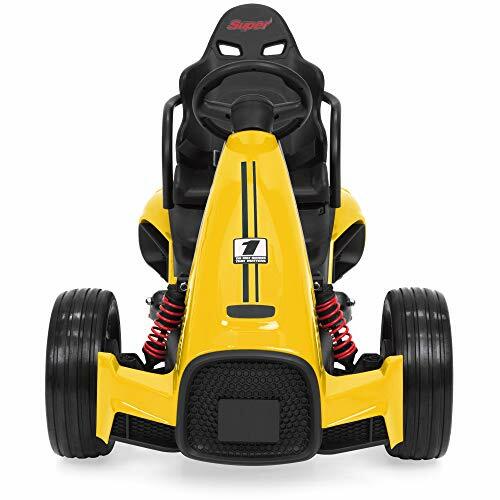 Frame High-Tensile Steel - Seat Belt & Adjustable Seat - Max Rider Height 5'0"
The final electric Go-Kart for kids on my list today is the fastest and most expensive one we’ll be taking a look at. The Go-Bowen Baja is a technically impressive marvel of a vehicle with power and speeds that will leave everything else in the dust. What first stands out about the Baja electric Go-Kart is its motor and battery. The 1000 watt motor and the 48-volt battery make it leagues above the rest of the Go-Karts on this list. It has a whopping max speed of 20 miles per hour making it effectively as fast as actual Go-Karts at a dedicated track course. The powerful battery allows it to last over an hour on faster settings meaning that the cumbersome task of plugging it into a wall has been kept to a minimum. Like real Go-Karts, the Baja is activated by a foot pedal giving kids the sense of realism that always puts them in the zone. Additionally, it has a standard steering wheel and a body frame that looks just like the Go-Karts at the track. As you can probably guess from the power of the motor, the Baja is designed for slightly older audiences. It weighs around 140 pounds and has a max load capacity of 179 pounds. It is a little small, so taller riders may feel cramped. But even teenagers can still ride in this thing and get a fun riding experience. Parents of younger children will be a fan of the safety features to balance out the fast speeds. It has a standard braking system and seat belt, but more importantly is the alternate speed restriction. With the turn of a key, you can set the max speed to be lower than 20mph if you are concerned that that is too fast for your young ones. The other limited max speeds are 7mph and 15mph. This is great for sharing with younger riders or if you want your child to get acclimated to the speeds before going straight for the fastest setting. With standard safety features, a well-built metal frame and solid wheels that can handle fast speeds, this is the electric Go-Kart to get if you think the children in your life can handle the speed. Thanks for reading my list of the best electric Go-Karts for kids. Each vehicle is well tailored for children of different ages, weights, and heights. Depending on the speed level you’re looking for, you should be able to choose one that fits your needs from this list of the top four. No matter what kind of kid you’re looking to buy for, they’ll be able to get hours’ worth of outdoors fun and get away from their tablet, computer, or television for some fresh air.